It is almost certainly true that the erosion of the newspaper biz contributed significantly to the scandal that sneaked up on residents of Bell, an L.A. suburb, a decade ago. Various investigations showed that city officials were paying themselves the highest municipal salaries in the nation, financed by especially high property taxes imposed on people who couldn’t afford them. Seven city officials were convicted. It isn’t a coincidence that the shenanigans started around the time the Los Angeles Times stopped following the goings-on in Bell as the newspaper closed suburban bureaus and started focusing on digital clicks instead of public service. Which brings me to the point. The latest thing to make me smile was Tuesday’s email from Seaside City Councilman Jon Wizard with a preview of today’s council meeting. Wizard sent it to just about everyone he knows, not just to me. It amounts to a short but useful preview of the meeting highlights: A discussion of how the city should replace City Attorney Don Freeman, who is about to retire from that position, and a report from Freeman on the recent audit of council spending, precipitated by some extravagant spending by former Council Member Kayla Jones. It also mentions that the council would be voting on the City Hall solar project. It made me happy to see the message, but a bit wistful as well. Happy because Wizard is taking some smart steps toward engaging the public in the murky processes of city government. It’s a lot easier for the citizenry to digest Wizard’s missive than it is to try to download and dissect a computerized council agenda. Wistful because this is what newspapers used to do on a very regular basis – tell the readership about items of public importance coming up before city councils, boards of supervisors and the like, and then actually covering those items. I’d encourage council and commission members everywhere to take Wizard’s lead and help their own folks follow along. In order for the full story to emerge from the city halls of Marina and Carmel, Pacific Grove and Monterey, it would take similar efforts by multiple officials in each jurisdiction. It would be better if they came from observers rather than officials or at least officials with different perspectives on what is and isn’t useful info. Even then some key stuff would undoubtedly be overlooked, things like the nonsense that followed Don Freeman’s retirement as city attorney in Carmel, but an incomplete account is better than no account at all. I’d encourage council and commission members everywhere to take Councilman Jon Wizard’s lead and help their own folks follow along. Whenever anyone proposes the recycling of waste water, someone in the crowd believes it’s part of a government plot to poison us all. Someone like John Moore, the retired Pacific Grove lawyer who spent years warning us, correctly, that some local government pensions are proving to be unaffordable. Now, via emails and Facebook posts, he’s on a new crusade, this time arguing that the Pure Water Monterey recycling project is ignoring science by planning to include polluted agricultural runoff in the mix to be treated to turn effluent into potable water. He was on firmer ground when talking about pensions. It is certainly true that ag runoff is a stew of troublesome ingredients, what with all the pesticides, fertilizers and other substances used in modern farming, not to mention salts and other natural substances. It is also true, as Moore contends, that the numerous agencies involved in regulating such things do not yet have one single test capable of detecting every possible element in farm runoff such as the heavily polluted Blanco Drain. But that does not mean the authorities are looking the other way. What cannot be accomplished by one test can indeed be accomplished by a series of filters and tests. This is not amateur hour as Moore wants people to believe. Pure Water Monterey is a joint venture between the Monterey Peninsula Water Management Agency and Monterey One Water, which used to be known as the Monterey Regional Water Pollution Agency. Those agencies are headed by Dave Stoldt and Paul Sciuto respectively, battle-tested water experts, and the recycled water that eventually will flow from your tap will have been studied more closely than just about anything else you ingest. The agencies involved have competent staffs and solid boards of directors who use the same water as everyone else. He included a copy of the monitoring and testing requirements, including the testing required for water containing pesticides. They can be found here. “The drinking water regulators clearly understand what this project is doing,” Stoldt said. Cal Am has informed the PUC there is “no reason to believe” its long-delayed, terribly controversial and exceedingly expensive desalination plant won’t be up and running by December 2021. The Peninsula’s water purveyor, Cal Am, informed the state Public Utilities Commission that it is not ready to start negotiating with the Pure Water Monterey folks to buy any of the reclaimed water because the PWM project isn’t far enough along yet. Others who know about this stuff say the company’s time estimate could be reasonable from a permitting and construction standpoint but that the prospect of significant legislation over water rights and other issues puts the timeline in jeopardy. “Cal Am has said repeatedly they will build it, even if there are lawsuits. Hence the question will be (A) will the Supreme Court take the case? (B) Will there be some other lawsuit (e.g. coastal development permit)? (C) Will any lawsuit enjoin them from building? And (D) if not enjoined, but under a lawsuit, will they actually follow through on their promise to build even while being sued? 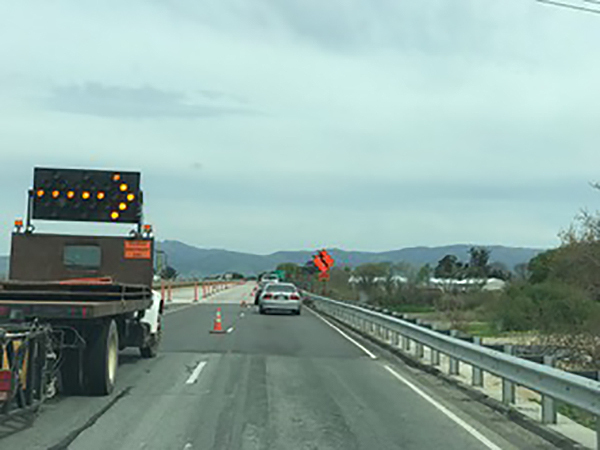 If you drive Highway 68 between Monterey and Salinas, you’ve likely noticed the widening work on the bridge over the Salinas River. And if you make the trip regularly, you’ve likely noticed it and noticed it and noticed it and noticed it and noticed it. No, the project has not gone on forever. It only seems like it. It started back in the spring of 2016. At last count it is scheduled to be completed in April. According to Caltrans spokesperson Susana Cruz, that’s only two months behind schedule. Weather mostly. Though I figure I have driven over the bridge a couple hundred times during the construction, I never had a clue what the work was all about until I asked Cruz. It’s about adding bike lanes, one in each direction. Cruz said the cost has gone up but not dramatically, from $17.9 million at the start of construction to $18.6 million now. Figuring the bridge is about a quarter mile long, that works out to about $1,176 an inch. Royal: Thank you for addressing this topic. It is true that there are tests for health safety for the recycling of municipal sewage, but in the history of man, no agency has ever before attempted to recycle agriculture wastewater. The permit allows PWM to recycle Salinas valley agriculture wastewater (including Blanco Drain and Resurrection Ditch, 303d sites, the most poison of all toxic water), but the tests to be applied are the tests devised and based on the history and tests for municipal waste recycling projects like the Orange Water District(which processes municipal sewage for potable purposes, but has safety mechanisms to prevent agriculture and industrial wastewater from the process). How did the local project obtain a permit from the Central Coast Regional Water Board? It informed the five lay -directors on that board, that there was ample precedent for such a project(See PWM EIR). They mis-represented the same lie to the CPUC(see PWM EIR). And they have just misrepresented to you Royal, that there are other like projects in existence and that there are protective health safety tests for the recycled agriculture wastewater, There are None. Royal, you were copied by me on a recent Dept of Drinking Water Policy rule. It specifies that Agriculture wastewater and oil wastewater are not eligible for a recycled use, not even for non-potable use. See Scan 227 to my recent e-mail. It is true that I am not a scientist, but as a licensed Stanford Law trained lawyer, I have hired, fired, examined hundreds of experts. I Know expertise, when I see it. There was and is not a single medically trained waste-water disease expert who has given the project a health safety ok. I have requested that PWM, the project entity obtain such an opinion, but it smartly refuses. I say smartly, because from my 300 plus hours of research about the health safety of the project, I know that there is not such a highly trained expert in the country that would endorse the safety of this project. If this project goes forward in its present use of AG wastewater, which I doubt, then the health safety of the project will be revealed by the human and animal diseases that arise. Of course those of you in Salinas, outside the Cal Am district will not be forced to buy this high risk mix. Again, than you for providing me this forum. Wow! This issue will definitely have to be resolved before they pump they treat and pump the water into the groundwater reservoir. It is amazing that the public has not been made aware of this issue. This is due to the another issue that Royal Calkin brought up in his latest post… the lack of staff at the our local newspapers to cover important issues like this. With the desal plant in real jeopardy due to the water rights issue and seawater intrusion into the Salinas Valley aquifer, we are getting dangerously close to having no solution for water issue in the works. The other desalination plant options are starting to look real good. Thank you Mr. Helmes: I have copied Jim Johnson staff water reporter of the Herald on dozens of e-mails(over the last year) that attach and quote the science about the health risks of allowing commercial wastewater like agriculture wastewater into the domestic sewage source water to be recycled for both potable and non-potable use. He has not been free to report on this critical health issue. The reason, IMO, is that the Herald thinks only short term and sees the project as a water transfusion for development and hence increased revenues. Paul Miller of the Pine Cone just doesn’t get it and is joyous about the recycle project. Both papers intentionally keep the public in the dark, because they do not want it concerned(consistent with your concern now that you have learned of this crisis). The experts at the Dept. of Drinking Water have resolved the split among them be disallowing any similar projects. But it needs a hero to “blow the whistle” on this PWM project that (IMO) obtained the permit to recycled poison agriculture wastewater by intentionally failing to disclose the health risks. The reaction of PWM is illustrated by their treatment of Royal’s inquiry: they cite the permit and the tests, but fail to reveal that the tests were never designed to reveal toxins in recycled agriculture. We are to be the beta test of the health safety of the wastewater. See letter M from the EIR for the project. It was authored by Mr. Jacques, the technical director of the Seaside Basin(which is to be the repository of the treated beta mix). He warned PWM about the history of the toxic nature of both Blanco Drain and Reclamation Ditch. PWM never addressed his concerns in the EIR, or. otherwise. I am in my eighties and I am unable to mount a local challenge to the project, but I will continue to challenge it in every way that I can. The Cedar Street Times recently printed a letter of mine about the danger of the project and for that I am very thankful. Hi Mr. Calkin – It’s great that Jon Wizard is informing our residents about city matters. meetings for years – he reviews upcoming agendas and answers any & all constituent concerns. Councilmember Dave Pacheco hosts semi-annual meetings highlighting city issues and introducing key personnel to the public. City Manager Craig Malin’s periodic Manifest is also very informative. After 46 years living here, I really feel that Seaside has become a transparency leader. Thanks for your Voices of Monterey Bay articles. I have barely discussed a separate danger of the PWM project in great detail. It may be even more dangerous than potable use of the recycled mix. Much of the mix of Ag wastewater and domestic sewage will be put thru a primary and secondary treatment, then without any advanced treatment it will be used by Salinas farms for irrigation of crops. Again Ag wastewater has never been utilized for such a purpose. The raw wastewater from pesticides, fumigants, fertilizers and plastics will be highly toxic, similar to putting DDT and Round-up in a diluted but toxic form on the soil and the crops. Workers in the fields will be at risk. But what will be the effect on the soil and the crops? I need to correct my Reply above about the use of the mix for irrigation of crops. While the mix is not subject to advanced treatment, there is in fact a primary, secondary and tertiary treatment of the water. I had only cited the first two steps of treatment. There is some precedent for the reuse of Ag run-off after the three step treatment, but my concern goes to the attempt to treat Blanco Drain and Resurrection Ditch sites. They contain decades of Ag waste and both are on the govt. 303d list which means the contaminated water cannot support aquatic life. Much more toxic than simple annual run off. To be honest, I have not researched this issue to the extent that I have the high risk involved in the attempt to recycle Ag wastewater for potable purposes and so will not comment about it again. WRT the waste water recycling…the inputs to the system are somewhat irrelevant if the outputs are thoroughly tested for contaminants. Of course the operators should eschew highly contaminated sources, but why not just regulate the use of chemicals being tossed into the water by the farmers? If someone is polluting the surface water to such an extent that it cannot be reclaimed, that seems to me to be the problem. Where’s the concern for the source of the pollution in the first place? I agree with Royal that John Moore is in over his head here. I am one of the seven (not five, as Mr. Moore stated) members of the Central Coast Regional Water Quality Control Board who voted to approve the injection of treated water from the Advanced Water Purification Facility of the Monterey One Water Treatment Plant into the Seaside aquifer in 2017. As Mr. Moore states, we are lay board members. What he does not state is that we are supported by a highly qualified staff of over 70 engineers, hydrologists, environmental scientists and agronomists, most of whom could earn more in private industry but have chosen to devote themselves to the cause of clean water. the project treats a combination of municipal stormwater, municipal sewage waste, industrial waste water (mostly wash water from food processing plants) and water that has drained from agricultural fields. All of these water sources have contamination problems ranging from grease and metals to pesticides (you would be surprised at the potential pesticide levels in urban stormwater) to high levels of nutrients and dissolved solids. In the past, we would have (and did) simply pushed all of that out to sea, either through the Salinas River or sewage outfalls. Increasingly, California has been looking for ways to recycle this water in a safe and effective way. While Mr. Moore focusses on the problems with agricultural wastewater, in fact, all of the inputs to this project pose potential problems to public health if not appropriately dealt with. All of the project inputs go through normal sewage treatment, and are then subjected to ozone treatment to kill bacteria, membrane filtration to remove remaining particulate matter, reverse osmosis treatment to remove virtually all other contaminants, including nutrient salts and pesticides, advanced oxidation to break down anything that has not been removed, stabilization so that it won’t corrode the pipes (pure H2O is hungry for minerals so some are added back) and is then injected into groundwater. The injection wells sites have been documented through extensive testing to be distant enough from the extraction wells to provide months of time lag as a safety measure and there are multiple monitoring wells between the injection and extraction wells which are regularly monitored for a range of constituents, including the pesticides, etc., which concern Mr. Moore, and including general toxicity tests to pick up anything that might be missed by other tests. While Mr. Moore implies that analyzing agricultural runoff is a totally new field, I must disagree. Our Regional Board has spend the last decade and more focussing on how to monitor and evaluate agricultural runoff, and are constantly sharpening our tools. Mike Johnston, Board Member, Central Coast Regional Water Quality Control Board. On the same page you will find a link that allows you to view live and archived webcasts of all meetings beginning with January of this year, and which allows you to jump to the specific agenda item which interests you. This is a huge step forward in trasparency, as our region extends from above Santa Cruz to South of Santa Barbara, and the meetings take place thoughout the region.